Juergen Schuster, who has been enthusiastically trying OraOpenSource Logger, raised an idea for the debug/instrumentation library requesting the addition of a standard synonym “l” for the package. The motive behind this request was to allow our PL/SQL code to remain easy to read, in spite of all the calls to logger sprinkled throughout that are needed for effective debugging and instrumentation. In the judgement of some (myself included) the addition of the synonym to the standard package would run the risk of causing clashes on some people’s systems; and ensuring that Logger is installable on all systems “out of the box” should, I think, take precedence. However, the readability of code is still an issue; so it was with that in mind that I suggested that perhaps an enhancement of our favourite development IDE would go a long way to improving the situation. 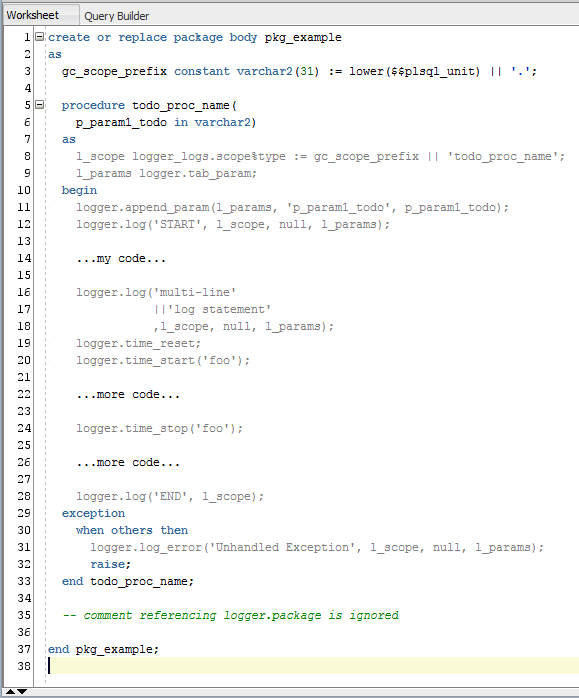 “The oracle open source Logger instrumentation library is gaining popularity and it would be great to build some specific support for it into SQL Developer, whether as a plugin or builtin. 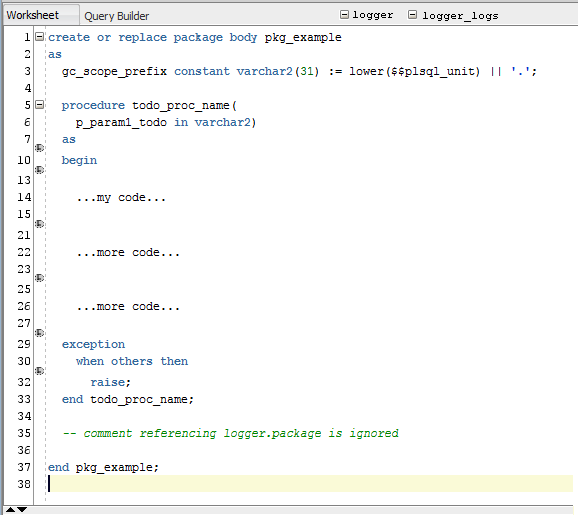 To enhance code readability, it would be helpful for PL/SQL developers to be able to hide/show, or dim (e.g. grey highlight) any code calling their preferred debug/instrumentation library (e.g. Logger). “Gold-plated” Option: add an option to the SQL Editor’s right-click context menu – on any identifier, select “Hide all lines with reference to this” and it adds the identifier to the list of things that are hidden! If you like the idea (or at least agree with the motive behind it) please vote for it.